Wine Wednesday is a super tasty sparking wine from our hood in Ghent, the Hudson-Chatham Winery. They make a Blanc de Blanc for about 20 bucks a bottle that will knock your socks off. We enjoyed it the other eve as we kicked-off our annual Sive niece supper/sleepover. All grown ups now, with several working in the culinary industry, they make us the meal and we supply the appetizers and drinks. I thought this would be a festive way to get the festivities started. With a nod towards the sweet, it was lovely serving it with cheese as it really stands up and compliments food. Would also be stellar served with dessert or chocolates. Of course the fab orange label grabbed my attention right off the bat, but this versatile bubbly will be on my list each Hawthorne stay. We enjoy rosé all year round, while I know some treat it like white shoes after Labor Day as a strict no-no. Pure silliness in my book as I think one misses out on some yummy pink throughout the year. Mont Gravet rosé is a bottle I turn to time and again because we really like it and the price is crazy good. At 10 bucks a bottle, this is wine to reach for when serving a crowd or large party. It works splendidly with food as well as enjoying a glass all by itself. A double winner! From some web searching: Mont Gravet rosé comes from specially selected Cinsault vineyards in the Languedoc region, located near the warm Mediterranean shoreline in Southern France. The Cinsault variety is also one of the main varietals used in the production of Provence rosé and some of the best reds of the Southern Rhone Valley. This rosé is a wonderful ‘anytime’ wine and a delicious aperitif. It pairs well with a wide variety of foods, is refreshing, savory and well-balanced. Mont Gravet rosé is a wonderfully fresh and fruit forward dry rosé wine. It has lovely aromas of raspberry and blackberry and is full body and long on the palate. Always a happy day when I get the call from Pike & Western Wine that the latest Domaine Tempier Bandol rosé has arrived. A Summer Wine Wednesday would not be complete without a mention of my all-time favorite rosé. It the benchmark which I hold all other rosé. A Kermit Lynch import, this wine is so sought after that it gets snatched up quite quickly. It is distributed quite widely, so it is available in most regions. Double the price of most bottles of rosé I typically write about, it is always a huge treat when we enjoy a bottle, so worth every penny. My tip for special bottles you savor–buy 6 bottles or a case. Almost always the price drops as most wine merchants give you a volume discount when you buy 6 or more bottles. If you see this on a wine list menu or on your wine shop shelves, I promise you are in for a treat. A shout-out to our friend Jeanne for snapping the above photo as I had put my phone away and did not take a single image last Sunday supper. Wine Wednesday is about doing a little tasting at your next dinner party. In this case, I chose some of our very favorite French rosé. We are super casual about it and just have guests taste which ones they would like. You can certainly be more regimented and taste one at a time and chat about each as you go. You could also choose wines from a certain region, or all from one vineyard. 3 is fine, 5 is what we prefer. Tons of possibilities. My number one rule is it must be fun! Ahhhhhh, it is that time of year again. Nope, scratch that, as a good rosé is really quite lovely any time, but this time of year it is much more abundantly available. Rosé can range considerably in quality and price. This group hits the sweet spot for under $20 a bottle, which always make me quite happy when we are hosting a large dinner or party. All French and all the palest of pink, which always tickles me. There really are so many yummy rosé out there, but it can be overwhelming. Keep in mind AIX, Domaine de Fontsainte and Triennes. A winning trio! Wine Wednesday brings us this 2014 Château Bel-Air Lussac Saint-Emilion brought in to the US from my friends at Peloton Imports in Seattle & Napa. We had this bottle with our first supper back to Hawthorne last week along with food from one of our favorite places in the hood, Local 111. Being in the country, by the time it takes us to drive to pick the food up, our order is ready. This wine drinks like a much more expensive version. The folks at Peloton do this so well, finding producers who create exceptional wines at exceptional value. Plus, they ship! You don’t have to buy 6 bottles, but if you do, shipping is only a penny for 6 or more bottles. They are one of my go-to sources for when we are planning a party up here and I want wine delivered. 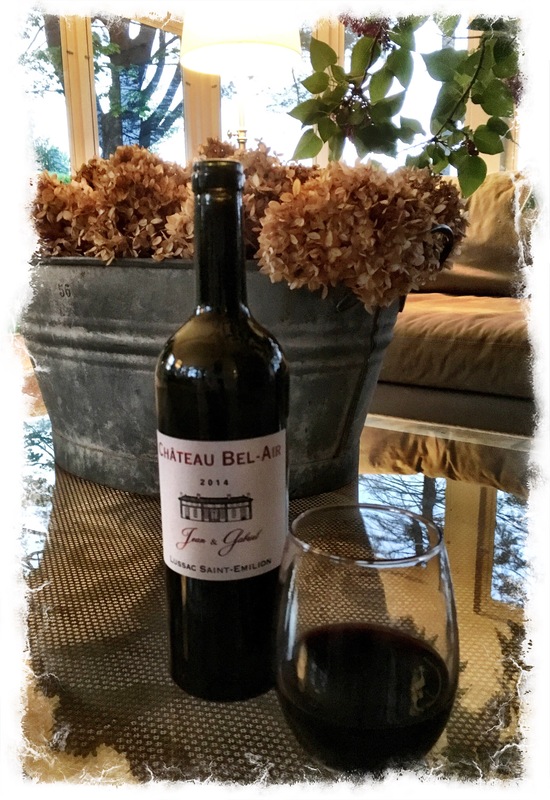 Now about this amazing wine: Château Bel-Air is in the heart of the Lussac Saint-Emilion appellation. The 50-acre estate has been in the Roi family for more than a century, and it is today run by Jean-Noël Roi. The estate makes several Merlot-based wines, and the flagship wine is the Cuvée Jean Gabriel, made from vines that are an average of 30 years old. Cuvée Jean Gabriel is a relatively new wine for the estate, debuting with the 1998 vintage. It is 50 percent Merlot and 50 percent Cabernet Franc and it is an homage to one of the past patriarchs of the family, Jean Gabriel Roi. It was made with help from consultant Stéphane Derenoncourt. About 12,000 bottles of Cuvée Jean Gabriel are made annually. Click Peloton Imports to check out this bottle and oh so many more. Happy Wednesday from the Hudson Valley! 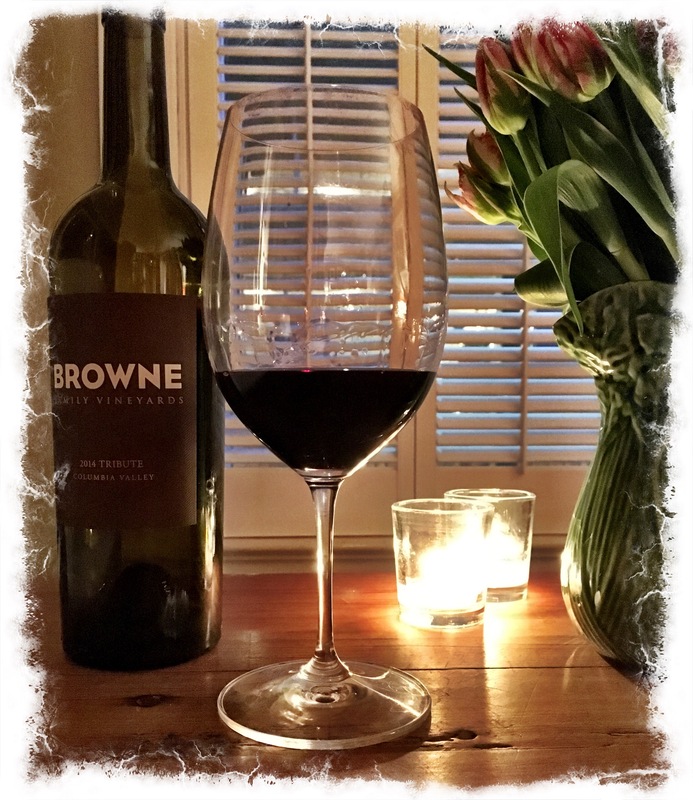 Wine Wednesday brings us this crazy good Cabernet Franc by our friend Robin Pollard. You might recognize her name from me writing about her and the coffee she roasts and blends for Watson Kennedy. She invited us over recently for a taste of her new wine on a lovely Vashon Sunday afternoon. Oh my, we were smitten with this new vintage. 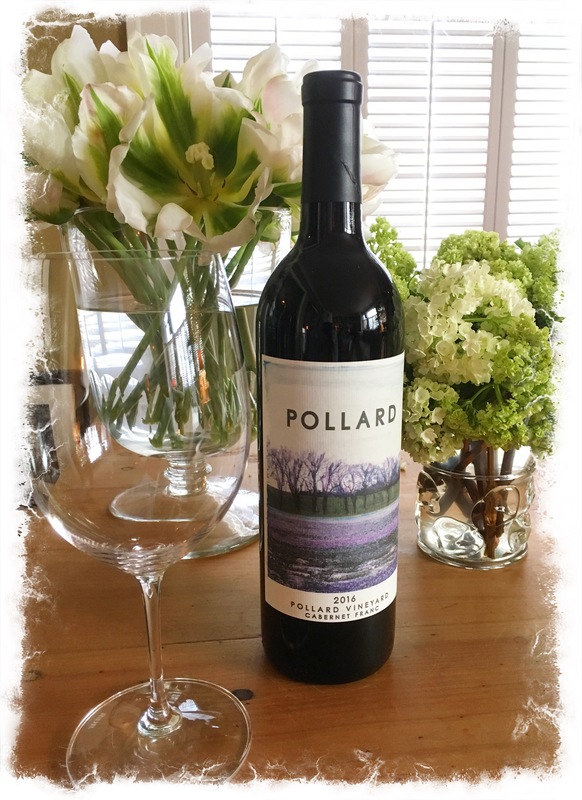 While her home is on the island, Pollard Vineyard is a ten acre site located in the Upper Yakima Valley of Washington State. Truly an exceptional part of the world for a vineyard. This is just her second bottling, her first I wrote about awhile back. I know many of you have asked me where to buy the wines I write about, and sadly, they are not always available in your area. Robin does ship this fabulous wine, if you are at all interested. Click here. We love supporting small businesses, and when that is a talented hard working friend–we say cheers to that! Sitting in a tasting room in downtown Seattle trying new wines while catching up with an old friend seemed quite civilized. Such was the case recently at the Browne Family Vineyards tasting room in Pioneer Square. We love our wine tastings in Napa or Sonoma or Walla Walla, so I was excited to learn about this lovely spot on First Avenue that just recently opened. Stylish as all get out, cozy and just a perfect spot to chat and laugh and drink some amazing wine. Which leads me to this bottle of Tribute. My friend Jackie & I were both quite taken with it, taking home bottles. We have since served it at several gatherings gaining much praise. 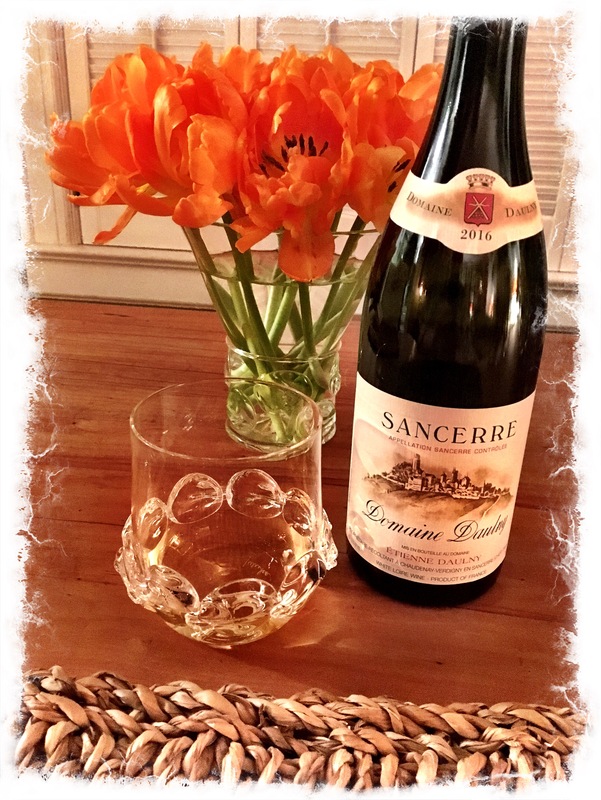 TPS was back visiting his mom in Montclair and picked up a bottle there, so it is distributed widely, which is always nice as I sometimes write about wines that folks from afar have a tough time finding. From the makers site: Dark fruit, flint and tanned leather aromatics. Fruit bomb with Van Cherry, currant and all spice. Finishes with anise, toasty oak and lingering dark fruit flavors. Acid is bright and balances this full bodied and round tannin wine. Wine Wednesday is recommended to us by Micheal Teer at Pike & Western Wine. Every so often at the end of my work week, which typically finishes up at my Market shop, I will enjoy a glass of wine with some of my 86 Pine framily–Peg, Camilla & Emily. This was a ‘you fly, I buy’ bottle Cam picked up for us at the end of a busy day, knowing I love crisp white wine. A glass was perfect then, without food, and I enjoyed a glass last evening with dinner. Around 20 bucks it is pretty darn perfect and has quite a bit going on. From my Google searching, as you all know I prefer to leave the ‘wine speak’ to the experts: The classique cuvée from Etienne Daulny is made with grapes coming from his fifty or so parcels around Verdigny including some in Perriers, Mont Damnés and Chaudenay. Aged purely in stainless-steel tanks, this is bright and pure–just the way we like our sauvignon blanc, with grassy notes, citrus fruits, and hints of blackcurrant bud. Those who favor nervy, taut Sauvignon Blanc will love this tangy version. The palate is crisp and fresh with beautiful minerality. The gift of wine can be such a lovely thing. During the Holidays we are given some pretty special bottles as our friends know how much we enjoy them. It is a huge treat to prepare a special meal around one of these special bottles. 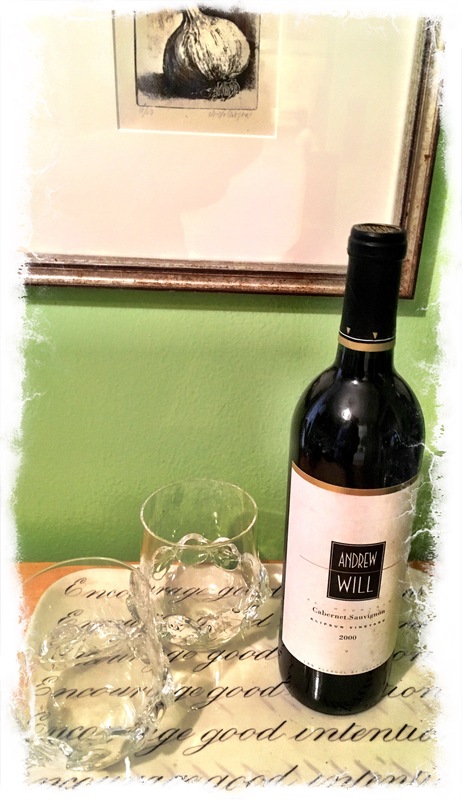 This Wine Wednesday post is as much about our love of all things Andrew Will Winery on Vashon Island as it is about this particular bottle. This Klipsun Vineyard Red Mountain Cab is pretty out of this world. Perfect for a chilly eve and a hearty meal to go with this meaty red. When you are perusing the wine shelves at your grocer or wine shop or scanning the wine list while dining out, if an Andrew Will catches your eye and intrigues you, go for it. Same with any wines from grapes grown on Red Mountain. I promise you won’t regret it. Andrew Will is owned by our pal Chris who is the partner of Robin Pollard who makes our POLLARD private label Watson Kennedy coffee for us. A bit about Chris and Red Mountain where the grapes for this bottle were grown, by way of wine.com. Andrew Will Winery was started in 1989 and is owned by Chris Camarda. The winery was launched out of a love for wine that Chris developed while working in the restaurant trade for almost 20 years. Named after his son Will and nephew Andrew, Andrew Will has been a major contributor in putting Washington State on the map as a world-class wine-producing region. A coveted source of top quality red grapes among premier Washington producers, the Red Mountain AVA is actually the smallest appellation in the state. As its name might suggest, it is actually neither a mountain nor is it composed of red earth. Instead the appellation is an anticline of the Yakima fold belt, a series of geologic folds that define a number of viticultural regions in the surrounding area. It is on the eastern edge of Yakima Valley and its slopes face southwest towards the Yakima River, ideal for the ripening of its grapes. The area’s springtime proliferation of cheatgrass, which has a reddish color, actually gives the area the name, “Red” Mountain.